Innovative flexible working time adapts to your individual working style. Flexitime combines the advantages of fast set and regular set into one reliable, flexible VPS material. You choose your working time (1 - 2½ min). The quick 2½ minute intraoral set time starts as soon as it’s placed in the mouth. Light flow is less viscous than Correct Flow. Medium flow is slightly more viscous (thicker) than Correct Flow. The wash materials exhibit superior physical properties such as contact angle, hydrophilicity and toughness – ideal for the most difficult cases. Contains: 2 x 50ml cartridges, 12 mixing tips. Contains: 12 x 50ml cartridges, 72 mixing tips. Contains: 50 x 50ml cartridges, no mixing tips. Contains: 12 x 50ml cartridges, 36 mixing tips. Contains: 2 x 50ml heavy tray cartridges; 1 x 50ml light flow cartridge; 1 x 50ml medium flow cartridge; 6 green mixing tips; 12 yellow mixing tips; 12 yellow intraoral tips; 1 x 10ml universal adhesive. For Correct Flow, light flow and medium flow cartridges. Mixing tips have yellow hub, clear barrel, and white mixer. For monophase and heavy tray cartridges. Mixing tips have green hub, clear barrel, and white mixer. Flexitime earned 4.0 stars out of a possible 5.0. 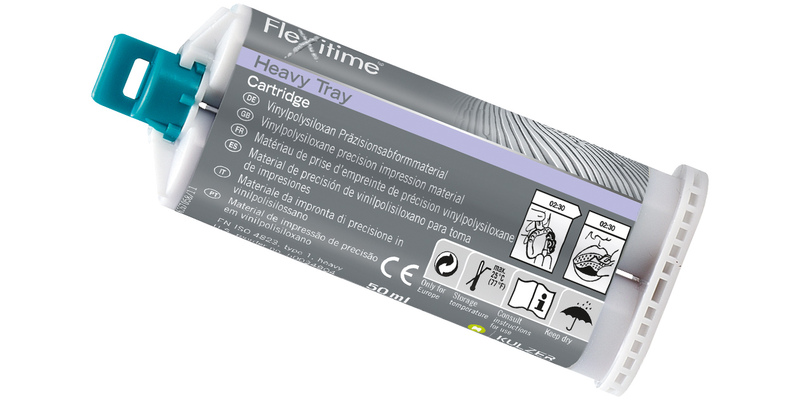 Full lineup of viscosities, regular and fast set (Xtreme), cartridges or Dynamix. New Light Flow completely fills the Shark Fin. Excellent accuracy and hydrophilicity, with all evaluators reporting well-fitting restorations, while an RRL test showed slightly smaller marginal gaps compared to Aquasil Ultra. Tear strength in RRL tests was in the middle of the pack. Xtreme is not available in a mixing machine version or in Light Flow. Great hydrophilicity, flow, and accuracy, but tear strength could be better.